The Cookbook of the United States Navy, NAVSANDA Publication 7, 1945, shows the culinary arts at the end of WW II. If you are looking for a particular recipe, the index starting on page 434 is a great place to start. Washington, D. C., 1 July 1945. 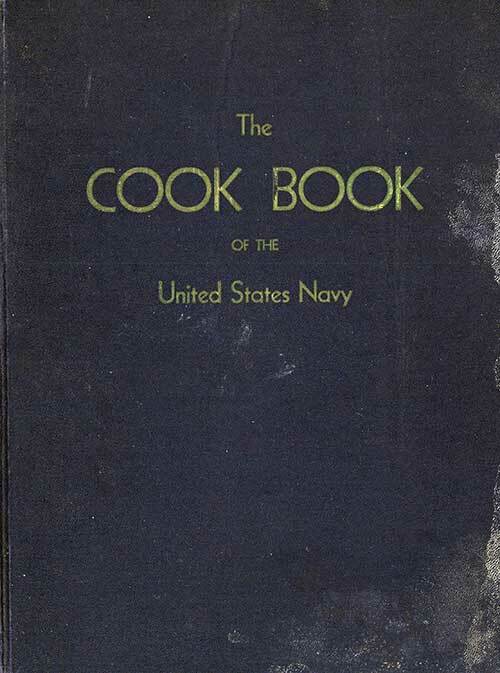 The Cook Book of the United States Navy contains a summary of the principles of cookery, menu planning, and a comprehensive collection of recipes based on the newer knowledge of nutrition. Many of the recipes were suggested and tested by commissary personnel of the Navy, and all the recipes have been developed and tested for practical use in the Navy. Supplementary information which will be helpful to commissary personnel in preparing food of high standard is presented in tabular and other form. In an attempt to assist with some of the feeding problems of the forces afloat and at advance bases, more recipes for dry provisions have been added in this edition. Chief of the Bureau of Supplies and Accounts.